Earn $48.74 in Rewards credit (4874 points) What's This? The Cannondale Synapse has always been a machine dedicated to the pursuit of full-day, full-throttle adventures. 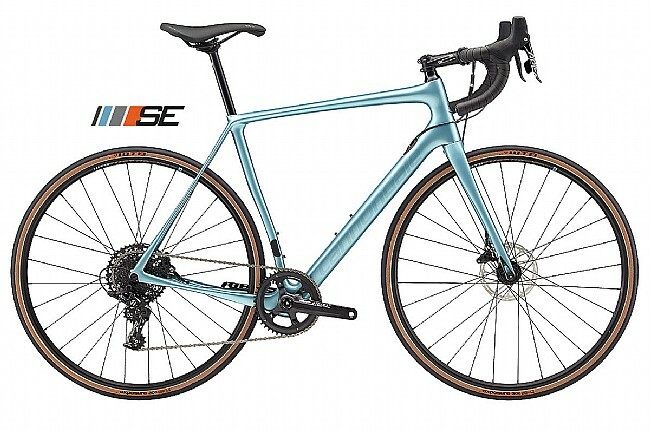 A legendary platform – multiple Bike-of-the-Year winner, raced by the world's best in the world's toughest races, hero of countless unnamed and unheralded exploits – the new Synapse Apex 1 SE Disc Bike takes what has always worked and makes it better... much, much better. Frame Material: Cannondale BallisTec Carbon w/ SAVE. Fork: Cannondale BallisTec Carbon w/ SAVE Plus. Headset: Synapse Si, 1-1/4" lower bearing, 25mm top cap. Shifters: SRAM Apex 1 HRD. Rear Derailleur: SRAM Apex1 Long cage. Crankset: SRAM Apex 1, 44T X-Sync . Cassette: SRAM PG-1130, 11-42 11-speed cassette. Brakeset:SRAM Apex 1 Hydro Disc, Flat Mount, 160/160mm. Handlebar: Cannondale C3 6061 Alloy Bar, compact. Stem: Cannondale C3 6061 Alloy Stem, 31.8, 6º. Saddle: Fabric Scoop Radius Sport. Seatpost: Cannondale C3 Seatpost, 6061 alloy, 25.4x350mm (48-56), 400mm (58-61). Rims: WTB KOM i21 rims, 28-hole, tubeless ready. Hubs: Formula CL-712 front, RXC-142 rear. Spokes: Double butted, Stainless steel. Front Axle: 12x100 Thru Axle. Rear Axle: 12x142 Thru Axle. Tires: WTB Exposure 30c, Tubeless Tires . Manufacturer Warranty: Lifetime frame and fork.